There’s no better way to enjoy your garden than by encouraging it to grow bigger and better. Before your summer veggies and flowers peak, take your garden to the next-level by refueling it. Knock-out these 5 essential tasks and your garden will thank you. You’ll extend your summer season and ensure that your lawn and garden are in tip-top shape. 1. Hydrate. When it’s hot, dry and muggy, the best thing is a nice cold drink. Your plants need some H2O, too. The trick to keeping your garden hydrated during the hottest days is not to water more. It’s to water smarter. Water plants deeply in the morning so they have the entire day to soak it up. 2. Keep plants fed. Your summer veggies and flowers are hungry. Feed hanging baskets, container gardens and annuals with liquid Bloom! plant food every 2 to 4 weeks. Vegetables such as tomatoes and peppers are heavy feeders. Continue to feed every 2 weeks with organic fertilizers Tomato-tone or Garden-tone. 3. Prune and deadhead. Extend the life of perennials by deadheading flowers as soon as they are spent. This will encourage plants to keep blooming as long as weather permits. Your roses will thank you. Prune tomato suckers and shrubs now, for fuller plants later. 4. Mow lawns strategically. When mowing, keep the mower blades high (3” or higher) to encourage healthy roots. Cut grass in the evening to give it time to recover and keep yourself cool. 5. Plant more! There are many quickly maturing plants that will thrive in summer gardens and be ready for harvest in the fall. Try planting radishes, cucumbers, beans and more. Sit back and relax! Take a good look at your hard work and dream about the rewards and bountiful harvests you’ll enjoy in the months to come. If you’re looking to get a better tomato harvest this summer, be sure to check out our complete tomato guide! Cracking and splitting are one of the most common problems when growing tomatoes. The good news: those unsightly cracks aren’t caused by pests or disease! Tomatoes split open when the fruit outpaces the growth of the skin — usually after a heavy rain. The bad news: split tomatoes can introduce bacteria into the fruit and cause them to rot. But wait, there is good news: this is an easy problem to remedy and you can start now. 1. Water: Water tomato plants once a week with about 1-2” of water. Keeping them regularly watered reduces the chance they will be shocked by a hard rain. 2. Mulch: Mulch does wonders for all plants, but especially for preventing cracking tomatoes. Add a layer of mulch 2-3” thick around plants to hold moisture. 3. 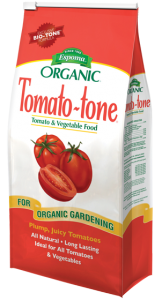 Feed: Fertilize tomatoes with organic Tomato-toneevery other week during the growing season. Fertilizer keeps the soil healthy so plants produce as many tomatoes as possible. 4. Location: Growing tomatoes in raised beds or containers with drainage holes will lessen the problem because heavy rain will drain away faster in the loose soil. 5. Pick: As a last minute fix, you can always go out after a heavy rain and pick any almost ripe or ripe tomatoes. While it may be too late now, you can plant varieties that are less likely to crack. Look for things like ‘crack-free’ in the description. Looking for more info on tomatoes, such as easy tomatoes to grow, hybrid tomatoes or non-red tomatoes, please visit our Organic Tomato Gardening Guide for more tips and tricks. Lazy days of summer? Think again! July can be a busy month in the garden. While watering and deadheading may seem like tedious tasks, harvesting and enjoying the bounty are the reward for months of hard work. Here are seven things to do in the garden this month. Follow the primary rule of summer watering to ensure garden plants get the right amount of water. Water thoroughly and deeply in the morning by making pools in the soil around the roots. Deep watering allows roots to grow deeper and stronger, making them less likely to dry up and die. When you water will depend on your weather. Check dryness by touching the soil. It should be moist at least 1” below the surface. Water containers and hanging baskets daily until water runs from the drainage holes. You can finally enjoy the fruits of your labor! Harvest tomatoes, peppers, peas, carrots, cauliflower, beans, broccoli, leeks, onions, eggplants, cucumbers, squash, Brussels sprouts, kale, lettuce, melons, parsnips, potatoes, radishes, pumpkins and rutabagas. Harvest tree and vine fruits when they are able to be gently plucked or twisted from their stems. Berries, apples and stone fruits should all be ready for picking in July. Pick, dry and freeze herbs for use later in the year. Sow seeds of cool-season crops such as greens and root vegetables for harvesting throughout August and September. Plant garlic for harvest next season. Prune tomato suckers weekly and cut off any leaves growing below the lowest ripening fruit trusses to improve air circulation and prevent diseases. Thin fruit trees for a more robust harvest. Continue to feed hanging baskets, container gardens and faded annuals with liquid fertilizer Bloom! every 2 to 4 weeks. Vegetables such as tomatoes and peppers are heavy feeders. Continue to feed every 2 weeks with organic fertilizers Tomato-tone or Garden-tone. Feed roses monthly through the summer with Rose-tone. Houseplants are actively growing now and will benefit from monthly feedings of Grow!. Using an organic lawn food, as well as organic mulch will eliminate the hazards that chemical fertilizers, pesticides and synthetic mulches present to you, your family and pets. July is the time to feed your lawn with the summer revitalizer from our annual feeding program. Water lawn regularly, slowly and deeply. Mow to 3″ to protect from summer heat. Watch for insect or disease damage as the weather gets hotter and plants become more stressed. Beetles, aphids, slugs, snails and spider mites are just a few of the pests that visit your garden in summer. For best solutions ask your local garden center for suggestions and consider the Earth-tone Controls. Keep an eye out for powdery mildew. Remove any affected leaves to prevent further spread. Clear weeds regularly, as they fight your plants for nutrients and water. Plus, you’ll want to pull before they have a chance to flower and go to seed. Otherwise, you’ll fight even more weeds next season. Cover freshly weeded beds with a layer of compost or mulch to conserve water and blanket weeds reducing their spreading. Prune summer flowering shrubs as soon as the blossoms fade. Deadhead annuals to promote more growth. Pinch fall blooming flowers such as coneflower and asters in mid-July to promote a fall garden full of color. Try to hold off on planting anything new until the fall as the hot temperatures and dry conditions can strain young roots. And you’ll benefit because most stores offer major end of season sales. If you do plant or transplant, make sure to fill the hole with Bio-tone starter plus and keep well-watered. Bonus: Enjoy! Take time to slow down and enjoy your garden with friends and family. We sure will be!